"We do not allow blasphemers to live. The gods demand a return to piety. Truth abides." The Servants of the Abiding Truth (Neru Pe 'Odosima in an archaic dialect of Sangheili), sometimes shortened to the Abiding Truth, are an ancient religious order of Sangheili fundamentalists who follow their species' pre-Covenant religious beliefs. Following the Great Schism and the fall of the Covenant, the Abiding Truth became one of the more prominent splinter groups among the Sangheili. Arbiter Thel 'Vadam and his allies take a view towards the Servants that the order considers to be blasphemous. With aid from the United Nations Space Command's Office of Naval Intelligence, the Servants of the Abiding Truth successfully incited an insurrection against 'Vadam's forces in 2553. For a time, the Servants' headquarters was a Forerunner structure known as the Temple of the Abiding Truth, located in the city-state of Ontom. The Servants converted their temple into a weapons cache and base of operations during their rebellion against Thel 'Vadam. After the Siege at Kolaar, the Servants fled to the former human colony of New Llanelli and established a new base of operations in a ruined city. Avu Med 'Telcam, known as "the Bishop" by ONI forces, was the leader and main representative for the Servants of the Abiding Truth until 2558. The Servants of the Abiding Truth was formed following the establishment of the Covenant in 852 BCE. The organization originally consisted of Sangheili that hid Forerunner artifacts from the San'Shyuum. The order was still existent during and after the Human-Covenant War. After the war, the Abiding Truth, now a militant cult under the leadership of former Field Master Avu Med 'Telcam, coordinated their operations and stored large amounts of their arms and equipment in the Temple of the Abiding Truth. Although the members of the Abiding Truth believed that the Covenant's Prophets had been false and betrayed them, they still felt that the Forerunners were still gods and demanded reverence and respect. Consequently, they believed that Thel 'Vadam and those loyal to him were committing blasphemy by saying otherwise. In January 2553, the United Nations Space Command's Office of Naval Intelligence organized a meeting between 'Telcam and Captain Serin Osman, along with Professor Evan Phillips on the glassed New Llanelli. 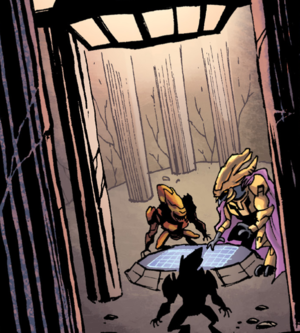 The purpose of the meeting was to negotiate terms of cooperation between ONI and the Servants of the Abiding Truth, as ONI wished to create unrest amongst the Sangheili and thereby remove them as a threat to the UNSC and humanity. 'Telcam agreed to accept ONI's assistance on the condition that the UNSC ceased to "blaspheme" the divinity of the Forerunners, and that humanity would remain uninvolved with Sangheili affairs following the Servants' successful takeover of Sangheili society - terms to which Osman agreed. 'Telcam met with ONI operatives again on New Llanelli, where he received a shipment of human and Sangheili weaponry to support his forces. However, he was questioning what Osman's real plan was. After Relon had decided to demolish a Forerunner monument on his farmland, the Servants saw this as blasphemy, and they soon destroyed his keep with a Spirit. Relon and his brother, Jalam, were killed and hung. The Servants left a message on their mutilated corpses to deter anyone else from such acts. Meeting with Forze 'Mdama and Jul 'Mdama in the state of Ontom, 'Telcam took them on a tour of the Temple of the Abiding Truth, pointing out the symbols that may lead to the Halo Array. In March 2553, Jiralhanae servants in the state of Ontom launched insurgent attacks, which resulted in the death of dozens of Sangheili. Their revolt was quickly quelled by the city militia. This led 'Telcam to the decision for an immediate assault on Vadam. Along with nine ships and forces from Nuan keep and Rtova keep, 'Telcam commanded the assault from the frigate Unflinching Resolve. Eventually, the Unflinching Resolve suffered a direct hit and crash landed. Despite being caught off-guard it appeared as though the Arbiter would be victorious, however, news spread that he allowed humans to land on Sanghelios; this caused many keeps to ally with the Servants of Abiding Truth and the tide turned in their favor. The Arbiter was caught off guard and when his own reinforcements couldn't arrive on time, he reluctantly accepted Admiral Terrence Hood's offer for help in fending off the attackers. The tide turned when UNSC Infinity arrived over Sanghelios and destroyed the rebel destroyer Defender of Faith before finishing off the rebel ground forces with a MAC round. The UNSC Port Stanley, posed as a Kig-Yar pirate ship, destroyed a few of 'Vadam's ships in order to maintain the stalemate between the two factions, leaving the Arbiter with a Pyrrhic victory. After the battle, 'Telcam fled to New Llanelli. Due to a lack of ships, 'Telcam put out a reward to the Kig-Yar to find the ship Pious Inquisitor. A shipmistress known as Chol Von soon took his offer, although she secretly planned to take the ship for herself and use it as a means to defend the Kig-Yar from external threats. Some time later, 'Telcam once again met members of Kilo-Five on New Llanelli, this time receiving Dr. Evan Phillips' notes on the Forerunner temple at Ontom for the religious significance they held. In return, 'Telcam provided information on the status of his civil war, the disappearance of Jul 'Mdama, and Pious Inquisitor. By the Battle of Requiem the Servants of the Abiding Truth had refused to join Jul 'Mdama's Covenant even after suffering great losses at the hands of the Swords of Sanghelios. 'Mdama himself was unaware that his son Dural 'Mdama, now known only as the Pale Blade, had risen to become a leading member of the Servants, working directly under 'Telcam. Several months later, on January 21, 2558, the Servants of the Abiding Truth were dealt a crushing blow when Avu Med 'Telcam and two of his ranking commanders were assassinated. 'Telcam had outserved his usefulness to ONI and was dispatched on New Llanelli by a lone Spartan, SPARTAN-G059. Although the Spartan-III assassin claimed the life of the Servants' leader, her secondary target, Avu Med 'Telcam's protege: Dural 'Mdama, was not present during the attack and lived on. Under the guidance of Dural 'Mdama, the Abiding Truth soon struck back at the UNSC and its Sangheili allies, infiltrating the Forerunner Dyson sphere at the former site of Onyx and endangering the scientific community inhabiting inside. After Sarcophagus was returned to its slipspace bubble for protection from the Created conflict and with the news that Jul 'Mdama and his Covenant were gone, the Servants retreated to the planet Mackintosh which had been pulled into the slipspace bubble as well and which contained a Forerunner warship of unknown class and the supplies needed for them to bide their time until they could strike back. Jul 'Mdama: "The Servants of Abiding Truth? But they were monks." Levu 'Mdama: "Well, we let them become warriors, and now they're dangerous, savage fools. And they seem to have stockpiled arms." Following the collapse of the Covenant empire, the Abiding Truth had begun stockpiling firearms and stealing former Covenant vehicles. The Servants of Abiding Truth, being an insurgent group, are not properly equipped to be a stand out military and make use of any material they can find. The Servants are known to utilize the Type-25 plasma rifle and the Type-25 plasma pistol as their main weapons. By 2553, a majority of the Abiding Truth's weapons were supplied by the Office of Naval Intelligence's Kilo-Five. The Servants have been also seen using Type-26 Wraiths and Type-32 Ghosts as part of their vehicular ground forces, as well as the Type-48 Revenant. The Type-46 Spectre also serves as a troop transport and anti-infantry vehicle. The Type-26 Banshee is the group's primary ground support aircraft and a number of Type-25 Spirit and Type-52 Phantom dropships have been used as troop transports and attack craft, albeit limited. The faction has also made use of several older Covenant models as part of their aircraft, such as the old Tarasque heavy fighter. Many other vehicles have also been utilized as part of their assault force. 'Telcam was known to use several vehicles when traveling across Sanghelios and New Llanelli, including a Kig-Yar shuttle. The group's fleet consists of at least five frigates and at least one destroyer. The group itself is mainly made up of thousands religious fanatics and true believers and have gained support from several other loyalist keeps, though they may not share their religious view. In the aftermath of the assault on Vadam, the Servants of Abiding Truth only had three frigates left on New Llanelli.